Never write a sequence of equations without the logic that connects them! Or let me phrase it in a harder, more explicit way: Real mathematicians never omit the logic of their arguments. Only teachers do that. Have I been clear enough? As a professor of math I have to correct a lot of things the school spoiled. So get at least this right! It is perfectly okay to set x to some value. It is also okay to multiply an equation by some value as long as you know that this is an implication only. So let us check. Every step of this chain of implications is perfectly valid. 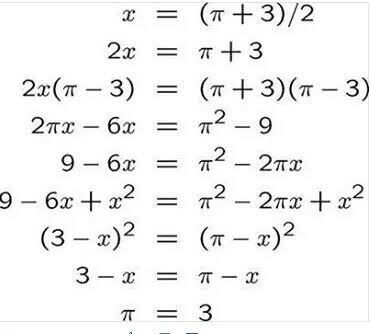 Note that the converse implications are only valid if we assume pi not equal to 3. For ac=bc implies a=b only if c is not equal to 0. The problematic step is the following. I write it with the correct implication. The missing logic is the reason for the nonsense at the end. If you do not believe that writing down and making clear of the logic is necessary either read the comments after the post in Google+, or even better, discuss this with your own class. You might be shocked. One final word: We may introduce the convention that writing down a sequence of equations means implication. After all, that reflects our thinking. But why not write it down explicitly? Would that really be too hard to do? In the line where you write it with the correct implication, a is being treated like a variable while b is a number, right? But I should have written the statement completely, as it would have been written in a math book: „For all a,b in the reals we have: a^2=b^2 implies a=b or a=-b“. „For all“ means for any real number you insert. „implies“ means that if the first thing is true for these numbers the second thing must be true too. Would that explanation help you? Moreover: „+-a=+-b“ is something we should not write. What is the meaning of this? This is the reason why I prefer „a=b or a=-b“ in favor of „a=+-b“. It is logically clear and sound. You are mentioning a difference between variables and numbers. These are terms of programming languages. Math is a bit like this, but not identical. It defines constants like pi, and sets variables to specific values like „let a=pi+3“, which makes „a“ a constant in the context. But a logical statement like „for all a,b …“ or „… implies …“ is something a programming language does not do. I really should blog about logic. Math is also a social system with conventions. Students learn this from their teachers. So we should be careful what we say.